In an unremarkable house in a quiet suburb filled with rather ordinary, if well-to-do folk, a respected and respectable doctor and his equally respectable wife, and later other members of their respectable family, sat down at a table – their séance table – and conducted the most remarkable series of psychical experiments ever put on record. They are remarkable, not only for their longevity – the experiments ran from 1918 to 1944 – but also for the probity of those involved and, most especially, for the richness of the apparent evidence obtained. Tables levitated and flew through the air. Spirits introduced themselves and conveyed messages from the other world. Mediums produced ectoplasm, sometimes stringy or formless, sometimes bearing images of the deceased and once moulding itself into a human form. We know all of this because they took scrupulous notes. And photographs. These were not posed ‘spirit photographs’, but images captured by a bank of cameras – full format, wide-angle, stereoscopic – in the midst of the séance. The result is one of the most marvellous archives of psychical research in the world: the Hamilton Family Fonds (‘fonds’, singular, is an archival term for a complete collection of material organically produced by a single source). The idea for this special issue came about, appositely enough, during the ‘Preserving the Historical Collections of Parapsychology’ conference in Utrecht in 2014 when I had the good fortune to meet Walter Meyer zu Erpen and Dr Shelley Sweeney. The former has devoted much of his life to the study of this unique collection. The latter runs the precious archives where they are kept safe for posterity. Thanks to their unstinting efforts in bringing this project to fruition, sometimes against some serious odds, we have created the definitive statement on the state of research into the Hamilton Family fonds. And thanks to the generosity of the University of Manitoba Archives & Special Collections (UMASC), we are particularly fortunate to be able to print some of that photographic evidence in this issue. We are privileged to have Janice Hamilton write the introduction to this special issue. She is the grand-daughter of Dr Thomas Glendenning Hamilton and Lillian Hamilton, the psychical researchers who led these experiments. Meyer zu Erpen goes deeper into the story with two articles looking at particular aspects of the case: table levitation; teleplasm (ectoplasm); and wax impressions allegedly made by spirits. Having experienced supposedly supernatural table levitation myself at a séance with Kai Mügge in 2015 [see PR75], I was particularly interested in the descriptions and photographic documentation of the Hamilton levitations. 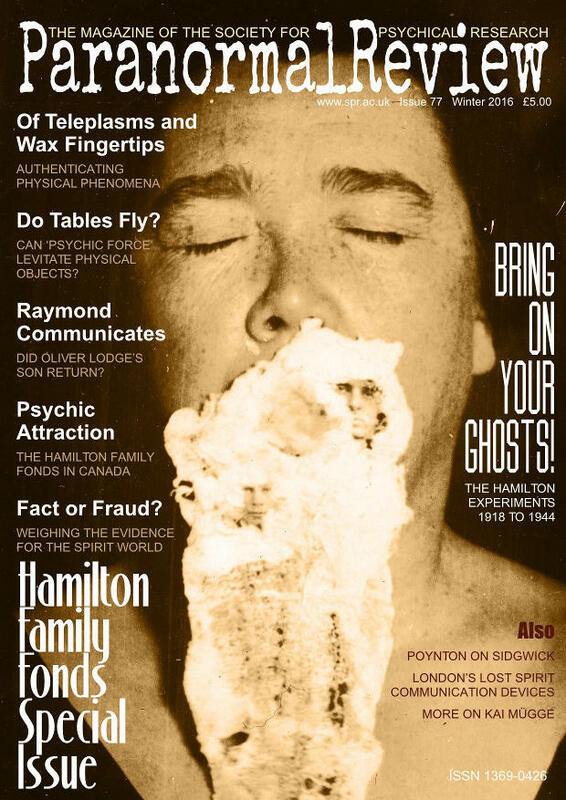 Readers will also notice that the Hamilton ‘teleplasm’ shown here generally appears quite different from the Helen Duncan ectoplasm sample that graced the cover of PR74. Meyer zu Erpen’s careful analysis of the authenticity of the phenomena in his third contribution, ‘Fact or Fraud?’, is particularly insightful. Walter David Falk looks at an aspect of particular interest to the SPR: the alleged communications from Raymond Lodge. We are able to reproduce a comparison of an original photograph of Raymond and his supposed ectoplasmic manifestation. Readers are invited to form their own opinions (and tell me about them). Shelley Sweeney contributes an account of the fonds itself. Artist Susan MacWilliam shows how it has been used, in her case, to make a film based on some of the material. The final assessment of the case by two of those with the greatest knowledge of it, Meyer zu Erpen and Sweeney, is an invaluable statement. We should not overlook that there are other lessons to be learned here. Sweeney notes how the Hamilton Family Fonds have become a magnet for other donations. The SPR Archives, already rich and wonderful, could also become a magnet, if only they were better known. As it has been pointed out to me, after the UMASC published the Register of the Thomas Glendenning Hamilton Collection in 1980, Leslie Price wrote a short review for our Journal. He concluded that ‘The Hamilton circle has been largely ignored by post-Margery researchers […] It deserves reassessment, perhaps by a Canadian worker with access to this collection.’ With this special issue, we now have that reassessment. SPR President Prof. John Poynton discusses the work of Henry Sidgwick and his thoughts on the ‘attitude of incredulity’. Janice Hamilton introduces us to the Thomas Glendenning Hamilton family séances, which took place from 1918 to 1944 in Winnipeg, Canada. Walter Meyer zu Erpen begins his assessment with an in-depth look at the Hamiltons’ experiments with ‘psychic force’ from 1921 to 1927. Walter Meyer zu Erpen continues with a look at*Dr William Creighton’s role*in authenticating physical phenomena at the Hamilton séances. Walter David Falk examines the teleplasmic appearance of Raymond Lodge at a Hamilton séance in 1929. Dr Shelley Sweeney introduces us to the Hamilton Family Fonds at the University of Manitoba and its role in stimulating further research and Spiritualist donations. Film-maker Susan MacWilliam discusses the teleplasmic appearances of Flammarion, Stead, Conan Doyle, Lodge and other SPR members, as well as Flammarion’s role in her 2009 film, F-L-A-M-M-A-R-I-O-N.
Walter Meyer zu Erpen weighs the evidence for the authenticity of the medium Mary Marshall’s teleplasms, with some challenging conclusions. 30 What Does It All Mean? Walter Meyer zu Erpen and Shelley Sweeney conclude the Hamilton special issue with a consideration of the Hamilton physical phenomena as evidence for life after death. Brandon Hodge searches for London’s lost spirit communication devices. Prof. Adrian Parker continues discussion of Kai Mügge’s mediumship.